This issue has sold-out and is now available free online. Click on the links below. News from the Lenton Local History Society. For the past couple of years Nottingham has been actively planning to acquire a Light Rapid Transit system for the city. If readers find that 'Light Rapid Transit' rings no bells try thinking trams instead. The vision is that a modem tram system will be able to transport large numbers of people in to and out of the city in a way that will help counter the clogging of our roads by commuter traffic. At the moment approval and the appropriate funding is being sought for an initial route between Hucknall and Nottingham taking in Moorbridge, Bulwell, Basford and Hyson Green. If this plan does manage to come to fruition and the tram route proves the success everyone wants it to be then a number of other routes waiting in the pipeline may be given the green light. These are reputed to include routes out to Clifton and Ruddington, Netherfield and Gedling, West Bridgford, and Beeston and Toton. 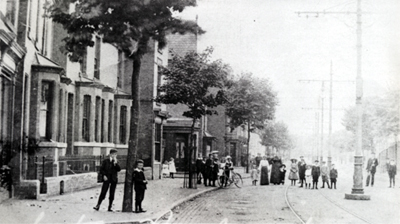 The last mentioned would presumably make its way into the City via Lenton. 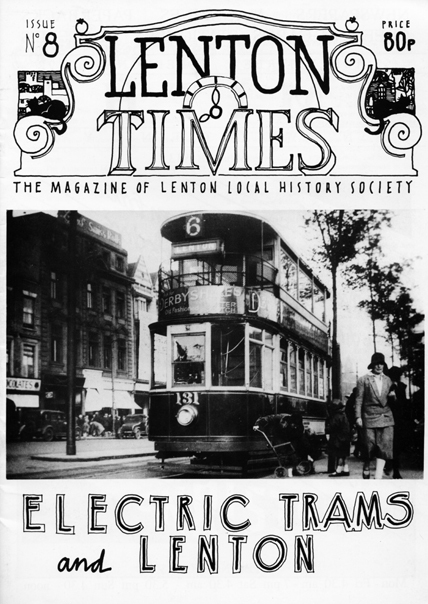 It is now almost sixty years since Lentonians were able to travel into town by tram. No doubt if they are able to repeat the experience it'll be something to tell their grandchildren. In the meantime, while they're waiting for the tram to arrive, we hope they and all the others too young to recall the trams the first time round will find our main feature of interest. Among the other articles on offer is one that would have appeared in our last issue had we had sufficient space. This is the piece on the graveyard survey carried out at the parish church by members of Lenton Local History Society. A lot of hard work went into the survey and it is no doubt edifying for those involved to see the fruits of their labour in print. Using several pages of the magazine in order to publish what is in effect an addendum to a family history publication may be thought somewhat wasteful of space by the rest of our readership. May we apologise in advance but defend our position by suggesting that it ought to prove of considerable use to family historians and there seemed no other way of getting the material into the public domain. And who knows - readers may spot the odd name among the list that sparks the memory cells into action!